As I've mentioned in the past, turmeric is known as a healing spice in traditional Chinese medicine. However, you don't need to feel weak to enjoy this delicious hot drink. I was able to buy fresh turmeric root at a local Indian market a few months ago and I've stored it in the freezer since then. After going through our freezer today, I decided make good use of it and prepared a turmeric latte. It's so delicious, soothing and relaxing, especially with the weather we've been having. You could prepare this drink with the milk of your choice. 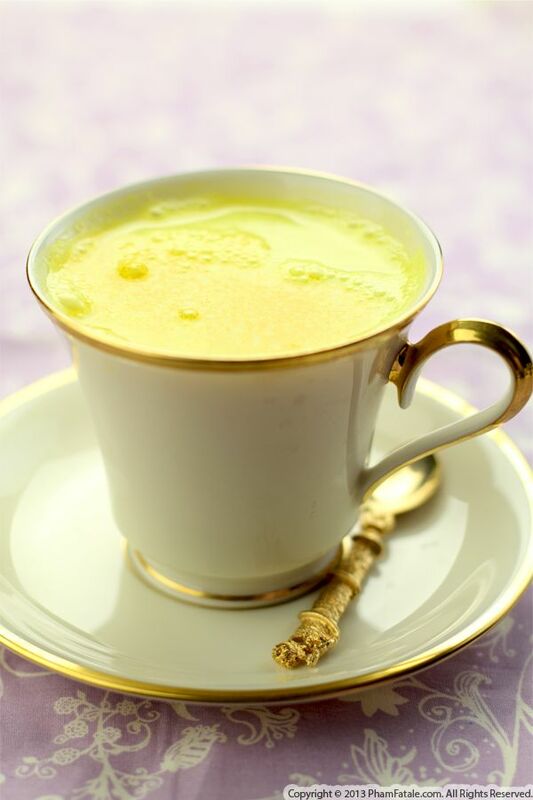 If you decide to go with a lower calorie milk such as almond or cashew milk, you could add a bit of coconut cream, oil or ghee (Indian clarified butter) to the turmeric. A little bit goes a long way but it makes such a difference and adds extra oomph. This weekend, in the spirit of the holidays, we wanted to make some eggnog. We’ve made eggnog and "soynog" so many times before that it seemed like time to mix it up a little. If you're a regular reader, you might know how much I love masala chai. I'm a weakling when it comes to caffeine but once in a while, especially when we have large family gatherings, we make loads of the fragrant chai and I just can't resist sipping a few cups. So why not combine the two? 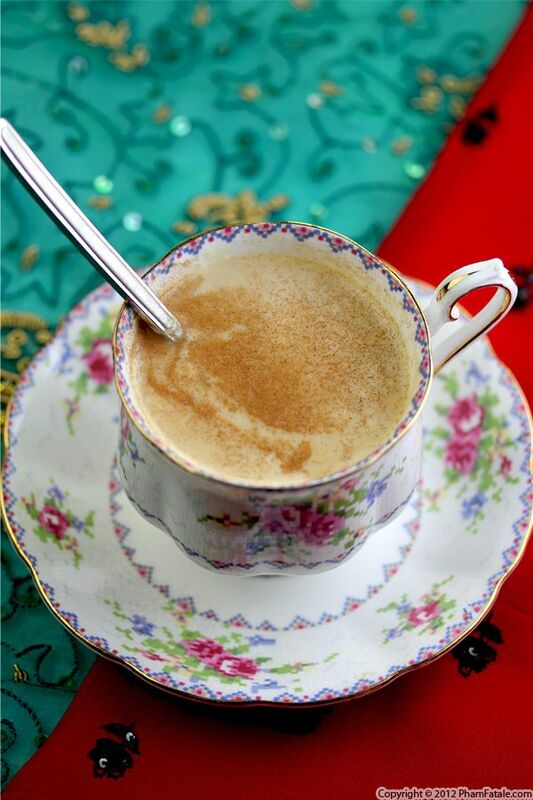 Eggnog already has nutmeg, so adding the spices used in masala chai just enhances the flavor. The cardamom in particular really shines through. If you're adventurous (and not making this for kids), you could also spike it with a little rum or cognac. I prepared my matcha green tea latte with the same procedure one would use for making white hot chocolate. The drink is made with a blend of lightly sweetened matcha green tea, white chocolate, steamed milk and heavy cream. 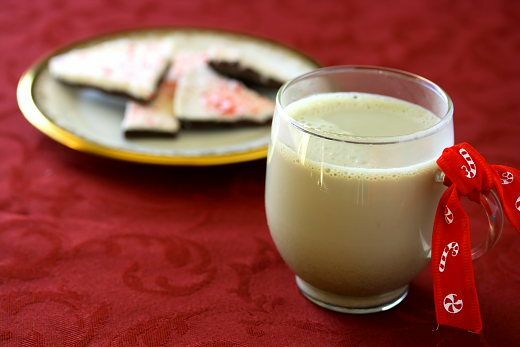 You wouldn't want to drink this every day, but that's what holiday treats are all about! This recipe can be modified to feature many different seasonal flavors. Peppermint, cinnamon and other spices come to mind. You don't have to go to the local coffee shop to enjoy holiday specials anymore; be your own barista and save the change for stocking stuffers. What's the cure for a chilly Fall afternoon? 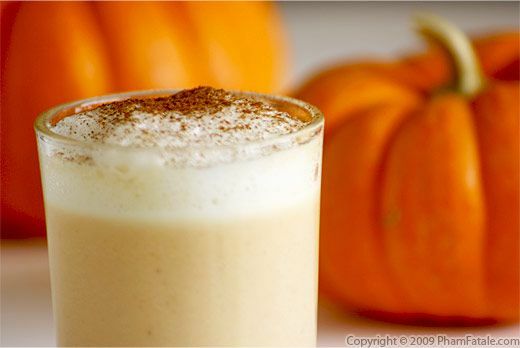 A pumpkin spice latte. I decided to make some today because the girls have the week off from school and they really wanted to cook. They wanted to make a pumpkin pie, but I thought it would be fun to take our pumpkin pie recipe and turn it into a drink. I've had pumpkin spice lattes in the past that really only have nutmeg and cinnamon. I made ours with real pumpkin purée, and I sweetened the latte with condensed milk, as I do for cà phê sữa nóng (Vietnamese-style coffee). It was such a hit. I served the latte in tall glasses, and as quickly as I poured it, the girls drank it. Sunny actually took to drinking it directly from the saucepan! There's definitely going to be a big pot of pumpkin spice latte on the table for Thanksgiving. If you try it, I bet it'll be on your table as well. 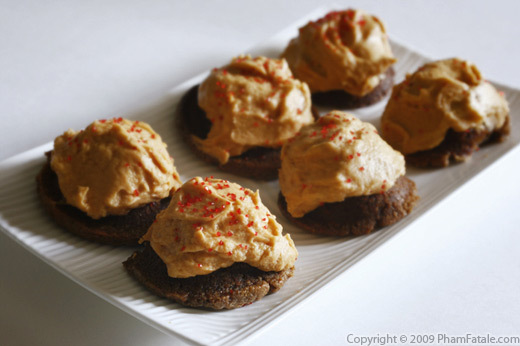 These mini-cakes are dense and similar in texture to a brownie. I use almond flour which I make myself as a substitute for ap flour. One of my husband's close friends is allergic to gluten, so I always make this when she visits. The cakes are ideal for chocolate addicts. The small sized bites make your guests feel less guilty, but will also have everyone coming back for seconds.